In April i analyzed the quality of the OpenStreetMap coastline data. I here want to give an update on some of the changes in the OSM coastline since April. One major problem was that assessing the quality without a reference of known accuracy is difficult. I have since made some new observation comparing to other data sets in some locations which i am also going to present here. There are many small changes of the coastline in the regions with high mapping activity of course – i will not cover those here but concentrate on the changes in more remote areas large enough to show up on the quality maps like below. The area in Indonesia i pointed out as an example for coarse coastline mapping has been improved. This is a local improvement however, in total the coastline in the region is still not very detailed. In the Caspian Sea a few islands previously missing from the Tyuleniy Archipelago have been added. Considering some of these islands are more than 10 km in size these were likely some of the largest missing features in the OSM coastline. There are some more islands further to the northeast in that area which are missing but since the northeastern part of the Caspian Sea is fairly shallow and water levels are somewhat variable so the exact coastline position is constantly moving. The ADD import introduced new data for Antarctica. The level of detail varies, where ice forms the coastline data is fairly coarse since it changes constantly making very detailed mapping somewhat pointless. The Antarctic Peninsula is mapped quite in detail. Over all not much has changed, the total length of the coastline is now 1.995 million kilometers (marginally more than in April). Some decrease in coastline length could be due to rivers and lakes being re-tagged as natural=water rather than coastline. The average node distance is now 64 meters (was 66 in April). The data sets i have used for comparison are the CanVec data for Canada and a Landsat derived coastline of Africa from the USGS. The USGS published a coastline of Africa recently as part of an Ecosystems map. This coastline is derived from a Landsat image mosaic and probably has a fairly uniform quality across the whole continent. 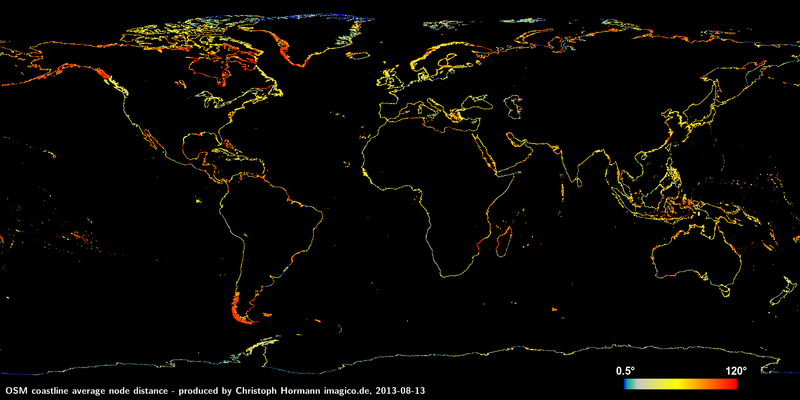 The data can be downloaded from the USGS site. A significant part of the African Coastline in OSM is PGS derived. Since PGS is based on Landsat images as well it is no surprise that those two are very similar in many areas as shown in the first example below. In areas with significant coast variation, either through tides or through river flooding there are larger differences. In comparison to the USGS data the OSM coastline is sometimes further to the land and sometimes further to the sea. This varies at fairly short distance which means that it cannot be explained by the Landsat images used representing varying tidal conditions. On the other hand these changes correlate with the use of different data sources in Openstreetmap. The PGS based sections tend to be quite far on the land side, sometimes obviously too far, i.e. significantly above a riverbed where water only reaches during seasonal floods and which are dry or wetland at other times. 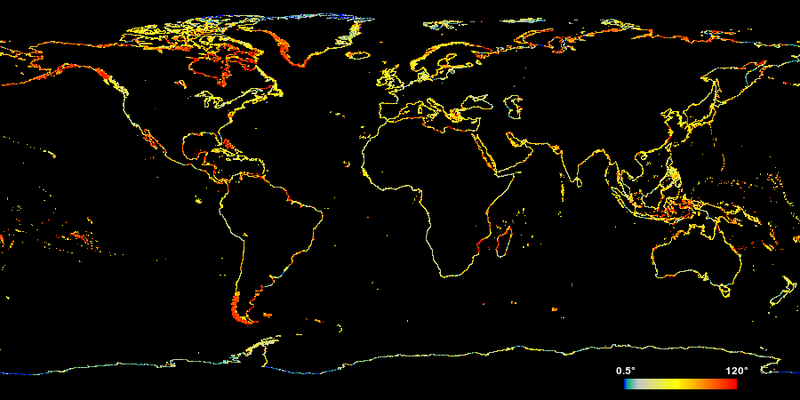 The third example shows that densely mapped areas like in South Africa are way more detailed than the USGS data. 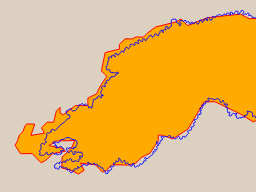 The USGS land/sea mask is shown in orange/red while the OSM coastline is in blue. The CanVec data set which can be downloaded from FTP contains detailed data for both ocean and inland waterbodies of whole Canada. In many parts this data has already been imported into OSM making comparison pointless. 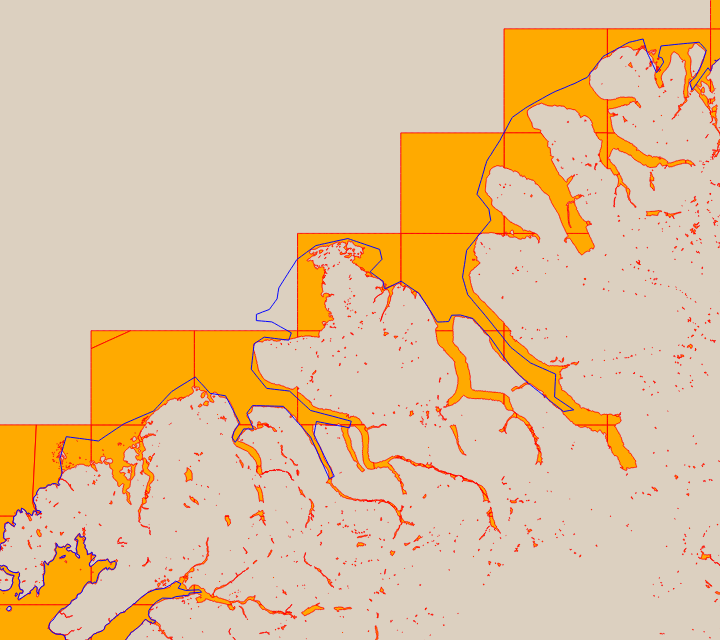 In the Canadian Arctic where there are some of the worst parts of the Openstreetmap coastline as i pointed out in the pervious analysis this has not yet been the case. Note while the Canvec data is frequently updated information in these remote areas is fairly old. The following image shows the OSM and Canvec coastlines in comparison – similar to the Africa examples above. 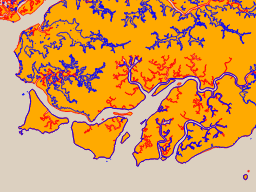 Note the Canvec data is water rather than land polygons (so orange is water) and includes inland water areas. Click on the map to view in Openstreetmap. The large bays missing in the Openstreetmap data are the ones with current or former ice shelves – well visible when comparing this image to the map in this paper from 1957. Most of these ice shelves have vanished in the meantime which also means the original source of the Openstreetmap data here must be quite old. Also interesting are the edges of this low detail area. 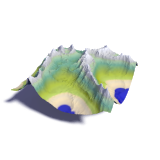 On the eastern side a section from the northmost part of Ellesmere island has been imported from Canvec data previously. The southwestern side edge is the northern edge of row 1 landsat scenes which forms the limit of both PGS and satellite image sources commonly used in OSM mapping.